The stark, broken pillars silhouetted against the gray winter sky can't be found in the ruins of ancient Rome. Back in February of 1958, they were all that was left of one of downtown Fort Wayne's most fondly remembered landmarks - the original Barr Street Market. In 1910, two stone pavilions, supported by massive stone columns, were erected along Barr Street between Berry and Washington. A huge wrought-iron arch connected the two sections at the Barr and West Wayne streets intersection. It cost the city $20,000 to build the pavilions, which were designed by Fort Wayne's most renowned architectural firm, Wing & Mahurin. For decades thereafter, the Barr Street Market was a beehive of activity, drawing farmers and shoppers from throughout northern Indiana and Ohio. Even during the Great Depression, the market prospered - a prosperity which continued through World War II before finally waning in the 1950s. During its heyday, the market operated day and night, six days a week. But by the 1950s, not only had business decline, but the condition of the pavilions had declined as well. 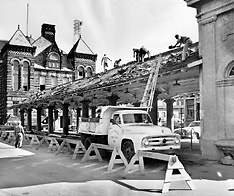 Since the 1950s was part of an era that had not yet discovered the feasibility of preserving old buildings, the decision was made to tear the pavilions down. So in 1957, the north section of the market disappeared. A year later, the south half vanished, to make room for parking slots and meters. Thus ended the 120-year history of the Barr Street Market, which had opened in 1837 when Sam Hanna donated land for a market and city hall. In 1973, the market area was partially restored, but never again achieved the same popularity.